Mephisto being unloaded from the S.S. "Armagh" at the Norman Wharf, a week after its arrival in Brisbane on 2 June 1919. 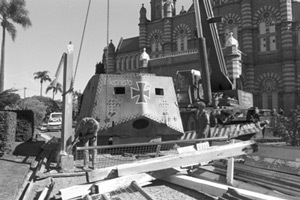 Mephisto being moved from its first Queensland home to the new Queensland Museum in 1986. 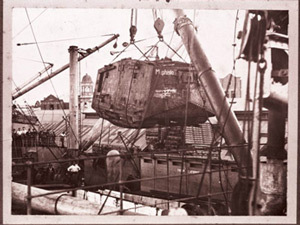 Mephisto being craned onto a heavy transport for transportation to an off-site storage and conservation facility, February 2011.The recovery of Mephisto in France began a long history of movement for this only remaining example of a German First World War Tank. In 1986, Mephisto was relocated to the South Bank campus of the Queensland Museum. It resided in a purpose built climate controlled space in the Dinosaur Garden until the floods of 2011. Since then Mephisto has made the journey north of Brisbane to a facility where it underwent conservation and in early 2013 was moved once again to The Workshops Rail Museum. From July 2015 to June 2017, Mephisto was on display at the Australian War Memorial in Canberra. Mephisto will move to its permanent home in the Anzac Legacy Gallery at Queensland Museum South Bank and be on display when it opens in late 2018.